First, let us answer some common questions and concerns about registering for our famous window tinting training school and/or paying for these course(s) with the Questions & Answers below followed by the 1 - 2 - 3 Steps to registration! If this does not confidently answer your registration questions, and you need to speak to us immediately, then please call our corporate office in San Diego, CA @ 1-800-580-7953 or email us through our Contact Us link above. Thank you! If paying by credit/debit card or PayPal, please proceed to Step #1 and Step #2 below and use our on-line Shopping Cart. Or, proceed directly to Step #3 and call in your credit card information. If you choose to use our Shopping Cart, be sure to follow the instructions and click the "check out" button directly below your payment total. NOTE: please know all of your traveling Information (i.e. hotel, rental car, shuttle service and airport destination) is provided by clicking on Step #3 below; and by doing so does not obligate you to register, but will show you that information in the instructions at the top of the page if needed. If you are registering for our Mobile Training courses, then you will also need to complete our Mobile Training Addendum by clicking HERE. 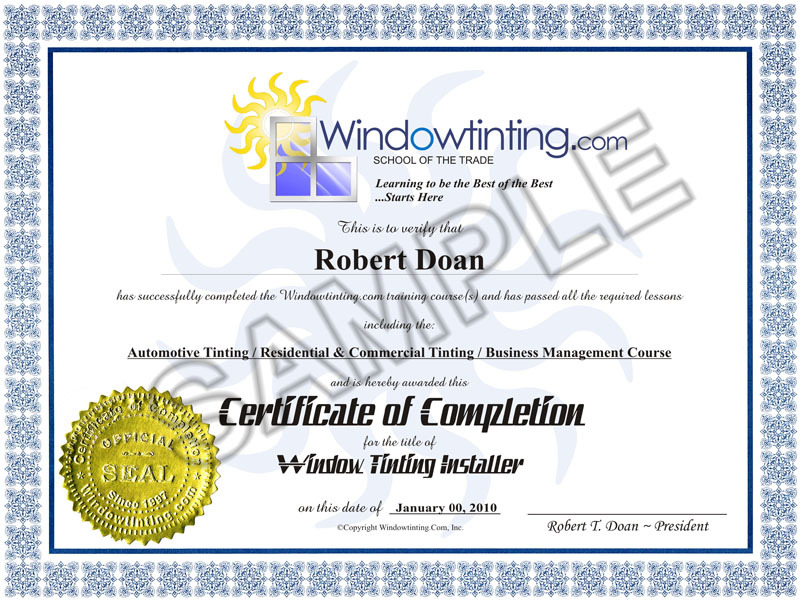 Simply submit your Refundable Application Fee(s)* and e-mail us your requested Start Date(s) to: info @ windowtinting.com and then we will confirm the next available "Start Date" to the course(s) of your choice; usually within 2 business days. Once you have agreed upon a date, you are then required to submit the First Payment which registers you for that Start Date. The Last Payment is not due until the end of your Start Date by money order, cash or credit card ONLY; checks will not be accepted. If you request an optional Flat Glass Course or Business Management Course, you are then required to add that Application Fee and any payments that apply to your registration process as described above. A.S.A.P.!!! Even though most courses start every two weeks...attendance is limited. All Application Fee(s) and First Payment(s) must be received no later than 15 days prior to your registered Start Date, unless otherwise agreed. Once all payments have been received, all Application Fee(s) and First Payment(s) are subject to being non-refundable. Please know that as per our Student Agreement, you may be entitled to a FULL refund (even the Application Fee & Deposit) if not satisfied for any reason, at our discretion, after attending your first day. Note: You may cancel for any reason (with written notice) up to 15 days prior to your registered Start Date and all Application Fee(s) and First Payment(s) can be credited towards the next available Start Date that is agreed upon. If you cancel after 15 days prior to your Start Date, or become a "no show", then your Application Fee and First Payment (or Payment in Full) are subject to be non-refundable and will be non-transferable and/or not credited for any reason. So in the unlikely event you need to cancel, please inform us ASAP so we have time in order to register another alternate and increase your chances for a FULL refund! As noted above, If paying by credit/debit card or PayPal, please use our secured Shopping Cart and simply fill out our Student Agreement Web Form in Step #3 below. Or, if needing to pay by check or money order make it payable to "Windowtinting.com" and mail it to: 1675 Pioneer Way #C, El Cajon, CA 92020. Most students choose to register on-line by submitting all payments via our private and secured Shopping Cart (Step #1 & #2 below) and submitting the Student Agreement Web Form in Step #3 below. Or, you may choose to mail your check, money order, or credit card information along with electronically submitting the Student Agreement Web Form and simply calling in your credit card information. Keep in mind that it must be received at least 15 days prior to your scheduled Start Date, unless otherwise agreed. If you need help with the registration process and submitting your payments, we'll be more than happy to assist you with that...just call! Because the Application Fee is the only way to begin your registration process for the course(s) of your choice and the First Payment is the only way to register you for that course(s) and grant you a Start Date. In addition, submitting the Student Agreement is the only way to finalize your registration process and for us to grant you an Acceptance Letter. Also, in the unlikely event our prices increase, this will guarantee you the price at that time in which you initially registered for! FACT: registration is on a first-come, first-serve basis...so don't be late! is the First Payment for the course of your choice using our secure & private Shopping Cart Home Page; where you will navigate to and submit your payment(s). After you "Check Out", please return here to the Registration Information page and continue with STEP#3. is the Student Agreement in its entirety. All your traveling information is provided with in the first paragraph along with how to fill out the form using the payment method of your choice! Then it is submitted it to us electronically...that's it! To view a sample of the Completion Certificate, click HERE. Here are a some links to help make the most of your travels to "sunny" San Diego, California!! !